Just when I thought I’d reached the limits of what I realistically could hope to find out about my great grandad in the Great War, family history threw another curveball. Last year I wrote about the 16 December 1914 German naval bombardment of Scarborough, Whitby and Hartlepool prompting my 46-year-old ex-Army great grandfather, Patrick Cassidy, to enlist on my grandma’s sixth birthday. He was discharged from the King’s Own Yorkshire Light Infantry the following month as unlikely to become an efficient soldier. Undeterred by this knock-back, by the summer of 1915 he returned to his original regiment, the Duke of Wellington’s (West Riding) Regiment. In the Electoral Register of 1918 he is shown as an absent voter due to military service. No Medal Index Card exists for him, so it appeared he must have seen the war out on home shores. I did keep an open mind about which regiment, but if I’m being honest, my assumption was the Duke of Wellingtons. This month, idly looking at Find My Past’s military records, I saw the familiar name of Patrick Cassidy. But not in the Army records. Instead it was the AIR 79 Series, British Royal Air Force (RAF) Airmen’s Service Records. It is definitely him. His Hume Street address in Batley, his birthplace (County Mayo), his marriage and children’s details are all correct (except eldest daughter Ellen is written as Helen). So no doubt whatsoever. He attested on 12 July 1918, and his service number 267675 fits in with June/July intake of civilians. Clearly Patrick had not lasted the duration of the war with the Duke of Wellingtons. A tribute to his persistence, he was now trying his hand with the fledgling RAF arm of the military. The RAF was born out of the difficulties arising from the competing supply needs, including men, of the Army-operated Royal Flying Corps (RFC) and its naval counterpart, the Royal Naval Air Service (RNAS). As a consequence design, technology, tactics and training were not being managed cost-effectively. From 1916, ideas of unification surfaced, with an Air Board being created to attempt to resolve the issues of purchasing and supply. But the problems continued and increased. Alongside the competition for aeroplanes and aircrew, concerns arose around supplying air support to the Army on the Western Front, dealing with the U-Boat menace at sea and improving the inadequate air defences at home. The latter was initially highlighted by Zeppelin raids. However by late May of 1917 huge German Gotha bomber aircraft began a bombing campaign, particularly targetting London, causing hundreds of deaths. As an interesting aside to these raids, the accompanying fresh wave of anti-German sentiment engendered by them, with the name of the Gotha aircraft now on lips countrywide, finally prompted the Royal Family name change. George V by royal proclamation on 17 July 1917, announced the dropping of the German Saxe-Coburg and Gotha, to be replaced by the English Windsor. In the wake of all this General Jan Smuts, a member of the War Cabinet, was tasked to look at air defence and broader air organisation. The South African Boer war opponent of the British, military leader and politician, who after the World War became South Africa’s second Prime Minister, recommended the creation of a united Air Force. On 29 November 1917 an Act of Parliament establishing an Air Force and an Air Council received the Royal Assent. 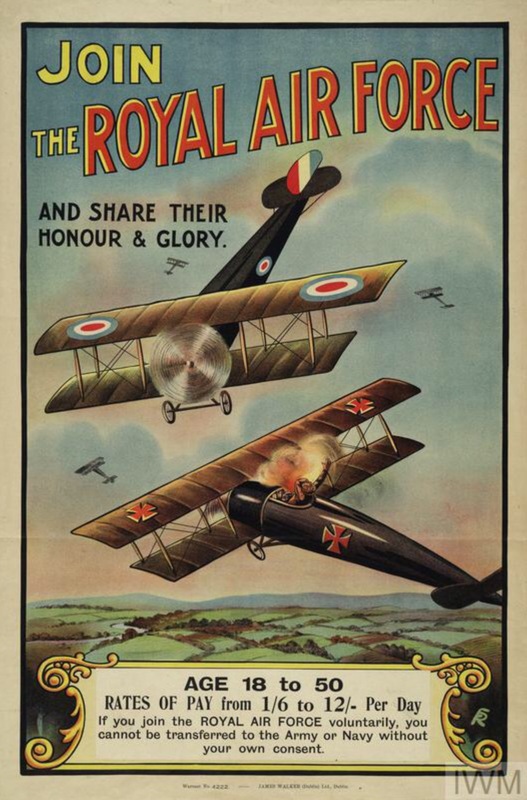 The Royal Air Force came into existence on 1 April 1918. Recruitment for this new branch of the Armed Forces now began in earnest, desperately required to fuel its rapid manpower expansion. Posters, adverts, newspaper articles and local recruitment rallies appeared appealing to 18-50 year olds, offering attractive pay rates and the promise of no compulsory transfer to the Army or Navy. “Opportunity is now offered during the months of June for enlistment in the Royal Air Force of men who are suitable as employment as clerks (in pay offices and stores as shorthand typists), as cooks, as hospital orderlies, as store men and as bat men. The men recruited must be over 35 years of age if in Grade II, or of any age from 18 if in Grade III. Specially strong men are required as labourers for airship landing parties and for thr Mediterranean Balloon Section. Grade I men over 40, Grade II men over 30 and Grade III men of any age are required. General labourers are also required in Grade II over 30, or Grade III any age“. “…instructions had been received from the Ministry of National Service that owing to the urgent necessity of maintaining all aerial craft, men of all ages and grades were required for the Royal Air Force. Certain branches of this work are being done and must be done by Grade 3 men. Higher grade men were needed for the fighting line. In the national interest, tribunals must consider the absolute necessity of Grade 3 men for the Air Force“. These pleas obviously appealed to my great grandfather, whose records show his occupation as one of those much in-demand labourers. His RAF attestation papers describe him standing at 5’3 1/2”, with grey eyes, a sallow complexion and dark grey hair. The grey hair is unsurprising. He was no spring chicken. His stated age is 49 and he gives his date of birth as 24 May 1869. This, yet again, is a false declaration. But not as wildly out as his 1914 attempts to get in the Army. He was in fact born in March 1868. He had shaved a year off in order to meet the age criteria for enlistment. His papers also show his Grade III category, able to serve at home. His rank was Private 2nd Class, so a service role. He was assigned by the RAF Reserve Depot (Blandford) to No.1 (Observer) School of Aerial Gunnery at Hythe, in Kent, as a batman: in other words a personal servant to a commissioned officer. Is this the man my grandma remembers coming to the house seeking my grandad, as recounted in my earlier post? His service record goes on to show his character as “very good” and his degree of proficiency “satisfactory“. However, on 6 November 1918, days before the Armistice, he was recategorised as Grade E. In other words permenantly unfit for service. He was finally discharged on 22 January 1919. His record also shows that he apparently received a modest pension for his service, but the writing is extremely faint. And on 1 May 1919 he was awarded a Silver War Badge, 7162. The Silver War Badge (SWB) was instituted in September 1916. British and Empire service personnel honourably discharged due to old age, wounds or sickness received or contracted at home or overseas, received this medal. To qualify, the recipient had to have served for at least seven days between 4 August 1914 and 31 December 1919. Therefore those discharged before the badge’s institution date received the honour retrospectively. The badge was worn on the right lapel of civilian clothes, an indication of the recipient’s loyal war service. This visible display aimed to put a stop to men discharged as no longer fit, but without any obvious physical injuries, being publicly humiliated, harassed and accused of cowardice and refusal to serve. The rolls for the SWB generally record the man’s date of enlistment and discharge, and whether he was discharged as the result of being wounded or through age or “sickness”. 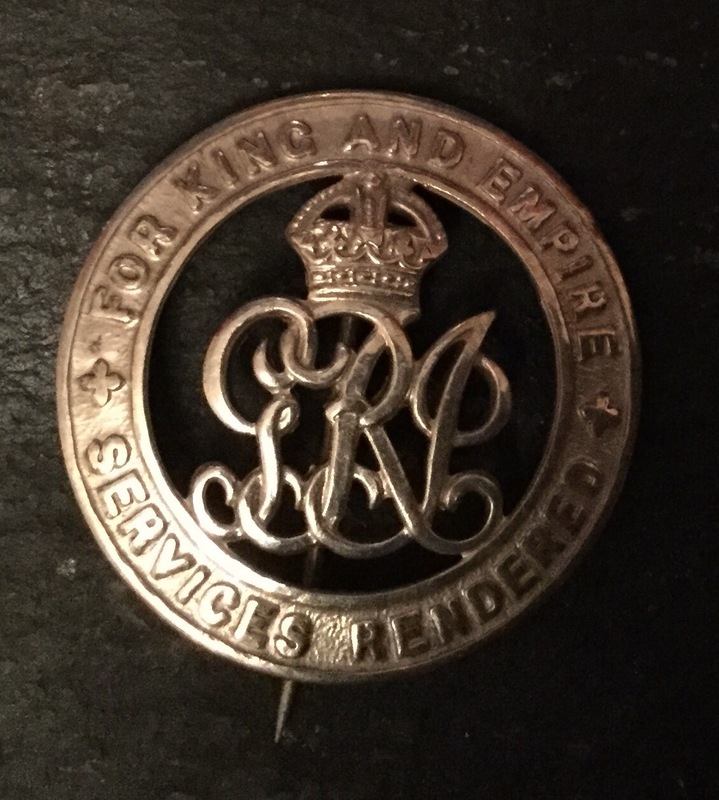 RAF men’s badge numbers bore the prefix “RAF“, with over 10,000 issued. These SWB rolls are at The National Archives and also available on commercial websites. Often, where service records no longer exist, these are the only indication that a man who did not go overseas served in the First World War. The bad news for me is my great grandad’s is not there. According to The National Archives, the only true RAF record relating to the SWB is in AIR 2/197/C33296. 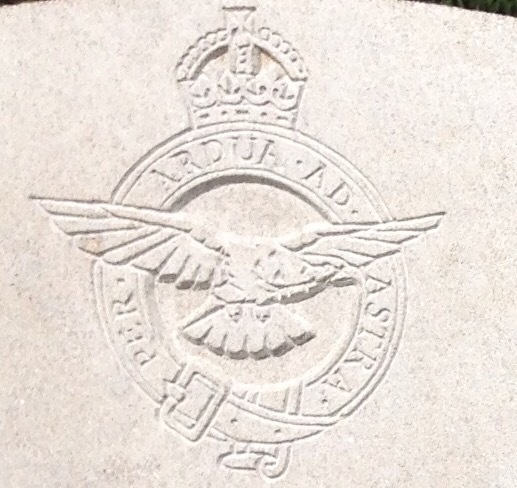 So, unless your RAF ancestor was a RFC recipient (WO 329/3244) or RNAS (ADM 171/173-87), you’re likely to draw a blank. This is something not made clear in the description on the commercial sites. Similarly, although RAF personnel did receive campaign medals, there are no medal rolls in The National Archives for men who joined after the formation of the RAF on 1 April 1918, unless they transferred from the RFC or RNAS. For direct RAF entrants you are reliant on service records for medal entitlement including, in the most part, for their SWBs. His willingness to embrace modernisation and progress, taking a leap into the future by joining the newly created RAF. I’ve also delighted in being able to tell my dad he wasn’t the first member of his family to join the RAF. The story has also reminded me of my own happy work-days in RAF contracts and, later, aero-engine supply management. Also the frightening march of time: I think most of the aircraft I dealt with are now obsolete, including Phantom, Buccaneer, Nimrod, Hunter, Harrier, Sea Harrier, Victor and Jaguar. I think the Hercules, Tucano and Hawk are the only ones left. But I’m a bit out of touch with aircraft now, so don’t take my word for that. From a family history angle, the moral of this story is don’t rule out the improbable in researching family history. Ancestors were real people and, as such, often made the unlikeliest of choices. Imperial War Museum images, © IWM (Art.IWM PST 5277, free to reuse for non-commercial purposes under the IWM Non Commercial Licence.